When I was living in Brooklyn, N.Y. one summer about 10 years ago, Bluetooth headsets for phones were just becoming popular. People walked or drove around with an earpiece in one ear, and you couldn’t always see it if you were on the other side of them. Watching people walk down the street or drive a car and seemingly talk to themselves was an incredibly strange sight. I thought I’d never get used to it. But now scenes like these are a normal part of everyday life and there’s nothing strange about them. I was, perhaps somewhat surprisingly, reminded of those Bluetooth-headset wearing New Yorkers while attending the Perennial Plant Association Symposium this past August in Minneapolis-St. Paul, Minn. I sat in on conference sessions, chatted with passionate plantspeople, toured greenhouses, hoophouses and a landscape arboretum and got a more in-depth look at what makes perennials great. But what does that have to do with Bluetooth headsets? During one of the conference sessions, Shannon Currey, who you may know from her marketing work at Hoffmann Nursery, talked about the need for landscapes to have a “purpose beyond the visual” and support the surrounding ecosystem, health and well-being of the people who interact with them. Perhaps these landscapes aren’t considered as aesthetically “beautiful” (at least in a traditional sense) as more standard designs, but they fulfill a greater purpose. Currey said that while landscapes like “urban meadows” may not be as common now, people will become accustomed to them as time goes on. Turn to page 12 to read more takeaways from the PPA Symposium. We’re also debuting our Manual for Success series this month, a special section that provides strategies and information about different aspects of a production topic. This month’s focus is lighting. Greenhouse experts like columnist John Bartok and researchers from Michigan State University, Iowa State University and North Carolina State University weigh in on seven different areas of interest. While growers have been experimenting with electrical lighting since the 1800s, its popularity has surged in recent years with advances in technology. One could say that it’s becoming more commonplace in horticultural settings. Checking yellow sticky cards for the presence of insect pests can help protect your crop. Maintain detailed records of your monitoring efforts. Place sticky cards where pests will congregate. Pests can be present in nearby gravel or under benches. Place sticky cards in these areas for additional pest detection. Visually inspecting plants can prevent unwanted damage. Bailey Nurseries hopes to encourage new gardeners to tackle projects with its first-timers video campaign. Amy and Luke Oeth are documenting their first time gardening as part of a video campaign to inspire other new gardeners to dig in. Amy and Luke Oeth bought their first house about a decade ago. Like many first-time homeowners, their improvement efforts were focused primarily indoors. Stripping their bathroom down to the studs didn’t intimidate them, and neither did building a stone patio in their backyard last summer, but plants were another story. Save for a raised bed vegetable garden, their house was surrounded by overgrown perennials and grass. That all changed this past spring. Amy Oeth works for GdB Agency, a PR and advertising firm that represents Bailey Nurseries’ brands, including First Editions Plants. The agency was brainstorming ways that Bailey could encourage customers, especially newbie gardeners, to get over their cultivating fears and get started. The other goal was to teach people how to pair plants in the landscape — another hurdle for the inexperienced. Videos of real-life people navigating new landscaping projects were pitched, and the agency decided that the Oeths were the perfect couple for the task. The Oeths have lived in their house for 10 years, but this is their first garden project. “What we wanted to do was find a way to show real projects to people that are inspiring, instill some confidence and encourage people to go out there and just try it out,” says Kris Fitzpatrick, account director at GdB. “When you think about DIY projects you do at your home, there’s usually something that’s technical that you have to figure out. With landscaping, the instructions are pretty basic. They’re calling it the first-timers campaign, with the tagline, “Turn your blandscape into a landscape.” The first video introducing the series features the real, likeable couple posing American Gothic-style, with ragtime piano music in the background and a narrator reassuring viewers that “Anyone can plant with pride and confidence,” because of the selection and breeding process. Bailey Nurseries and GdB are both located in Minnesota — St. Paul and Minneapolis respectively — and requested help from nearby Bachman’s, a garden center chain in the Twin Cities. Bachman’s sent a garden designer to help the Oeths plan the project before they got started. They began with the backyard to warm the space around their newly built patio. But, like many new gardeners, she wasn’t sure where to start. The Oeths’ garden before and after the first-timers project. Once they had their plan, the Oeths, armed with a tripod and video camera, documented their first days in the garden. During the first weekend, they amended and tilled the soil off-camera. The next weekend, they started rolling and planting their hydrangeas, dogwood, magnolia and other Bailey plants. The video is time lapsed, so all of those hours in the garden are condensed to about 1 to 2 minutes — an ideal run-time to ensure people will get through the entire video. More videos that feature specific gardening tips and solutions are in the works, Fitzpatrick says, as are interactive photo galleries with plant pairing ideas in the landscape that feature more than just Bailey plants. Topics are still being discussed, but they may cover transplanting, the Oeths’ front garden bed or how to recover when a storm has pelted your landscape. The digital campaign will include several platforms, including YouTube, the First Editions website, Houzz, Better Homes & Gardens and their social media channels. POP with images from the program will be available to garden centers as well. 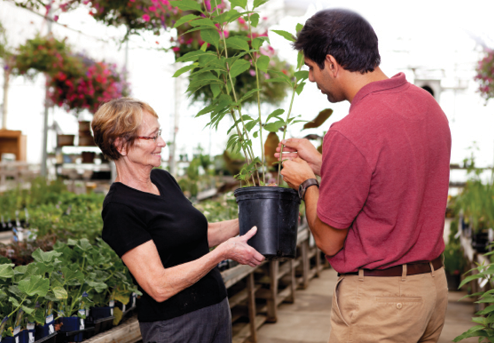 In the future, they may share and even create similar videos for new garden center staffers who are inexperienced as a training tool. Oeth wouldn’t mind continuing with the project, she says. Michelle is editor of Garden Center magazine, a GIE Media Horticulture Group sister publication. 4. Refrain from making excuses and allowances for bad behavior. Telling yourself or others things like, “That’s just Sherene,” or, “Alex is going through a difficult time,” is never helpful. Add, “But it’s not OK to engage in XYZ behavior,” to the end of the sentence, and you are well on your way to resolving the problem. As you step up to speak, you will encounter resistance from your problem employees. Everyone else will thank you for leading with integrity. Drop me a line and let me know how it goes. To view the 2016/2017 Disease Control Guide, please click on the cover image, or click here.